The petrous portion of the temporal bone lies in a complicated anatomic position and has critical relationships to important neural and vascular structures. Consequently, infections arising within or spreading to the petrous apex can result in severe clinical sequelae. DeWeese's admonition is still valid. Patients still occasionally present with petrous apicitis, and the clinician needs to be wary of the condition's presenting features to prevent possible life-threatening complications. An image depicting skull base anatomy can be seen below. Gradenigo syndrome, ie, petrous apicitis in combination with the clinical triad of headache, abducens nerve (cranial nerve [CN] VI) palsy, and otorrhea, is named after Giuseppe Gradenigo. In 1904, Gradenigo related his experience with this disorder in a manuscript entitled "Uber circumscripte Leptomeningitis mit spinalensymptomen und über Paralyse des N. Abducens otitischen Ursprungs," in the Archiv für Ohrenheilkunde. In the paper, Gradenigo summed up the disease process through its 3 principal symptoms, which "... dearly and mutually cohere: acute inflammation of the middle ear, continuing pain in the temporal and parietal area, and paralysis the N Abducens, which is indicated usually by the patient himself." Between the 1940s and the 1960s, the incidence of petrous apicitis was dramatically reduced, which is evidenced by the paucity of clinical manuscripts on the topic. This reduction was primarily due to the introduction of antibiotics. Most reports since this time are based on single clinical cases or very small clinical series. Petrous apicitis is a rare infection of the petrous apex of the temporal bone that occurs as an extension of a middle ear or mastoid infection. Petrous apicitis was commonly encountered before the introduction of antibiotics. It now appears quite rarely. Most reports on petrous apicitis in the literature are single clinical cases, and determining its frequency is difficult. Petrous apicitis is believed to result when organisms, typically pseudomonads, become trapped within the complex air cell system of the petrous apex. Blockage of this air cell system may result from acute or chronic inflammation or mechanical blockage from an obstructing lesion. Direct extension of infection from the mastoid and middle ear through pneumatized air cell tracts into the petrous apex is thought to be the etiology of petrous apicitis, which can occur as a rare complication of acute or chronic otitis media. [11, 12] An undetected and poorly drained infected air cell of the petrous apex must trail through small air cell tracts into the middle ear and mastoid. These cell tracts consist of the infralabyrinthine air cell tract, the retrofacial tract, and the peritubal air cells superior to the eustachian tube. Because of the extensive pneumatization and presence of rich bone marrow within the petrous apex, it is susceptible to infection or inflammation, typically in combination with mastoiditis. The proximity of the venous sinuses to the petrous apex is the reason for the historically high incidence of venous sinus thrombosis associated with petrous apicitis. The inflammation may extend into the Dorello canal, which transmits CN VI and the gasserian ganglion (CN V). Inflammation of the canal produces the triad of symptoms recognized by Gradenigo: lateral rectus (CN VI) palsy, retroorbital pain, and otorrhea. Pseudomonads are most often responsible for petrous apicitis. In rare cases, tuberculosis has been identified as the cause, primarily in individuals younger than 20 years. Rare cases of fungal petrous apicitis have also been described including aspergillosis and blastomycosis infections. Petrous apicitis may follow an acute or a chronic course. The acute form typically develops rapidly and is caused by sudden obstruction of a normally pneumatized petrous apex air cell system. This obstruction can be caused by mechanical blockage from a lesion within the mastoid or by acute mastoid inflammation. Chronic apicitis has a more indolent course and typically follows months to years of otorrhea. Patients may not appear acutely ill compared with those patients with acute petrositis. Chronic apicitis may result from chronic mastoid inflammation, or it may occur after a mastoid operation has led to blockage of the air cell system. The triad of retroorbital pain, lateral rectus (CN VI palsy), and otorrhea is pathognomic for petrous apicitis. However, the presence of this triad is uncommon, since antibiotics typically halt the disease process before it involves dural structures. The presence of both otorrhea and deep pain should lead the examining physician to suspect petrous apicitis. The anatomic relationship at the petrous tip may explain some of the symptoms of petrous apicitis. If the bony cortex of the anterior petrous apex is involved by the extension of infection, the infection may cause an epidural abscess in the region or damage nearby cranial nerves. On the superior aspect of the petrous tip lies the trigeminal or gasserian ganglion. Damage or irritation to the ganglion may explain the deep facial pain in some patients with apicitis. The petroclinoid ligament extends from the tip of the petrous apex to the clinoid is the petroclinoid ligament. The abducens nerve travels below the petroclinoid ligament in a small canal called the Dorello canal. The inflammation may extend into the Dorello canal, which transmits CN VI and the gasserian ganglion (CN V). Inflammation of the canal produces the triad of symptoms recognized by Gradenigo: lateral rectus (CN VI) palsy, retroorbital pain, and otorrhea. Indications for surgical drainage of the petrous apex in patients with petrous apicitis include failure to respond to medical (antimicrobial) therapy, the development of CN deficits as a result of extension of the infection, development of a petrous apex, epidural or parenchymal brain abscess, and the development of another life-threatening complication as a result of the infection. 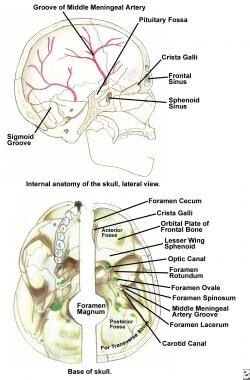 Wedged between the occipital bone and the greater wing of the sphenoid, the petrous portion of the temporal bone is shaped like a 3-sided pyramid. The pyramid's base is the medial wall of the middle ear. Two of the sides of the pyramid constitute the anterior floor of the middle cranial fossa and the anterolateral wall of the posterior fossa. The jugular bulb and inferior petrosal sinus line the inferior aspect of the petrous bone. Anterior and superior to the petrous apex lie CN V and the gasserian ganglion. CN VI traversing through the Dorello canal also lies in this region. At its apex lie the carotid artery and cavernous sinus. The petrous apex is the most surgically inaccessible portion of the temporal bone. A coronal plane through the internal auditory canal may arbitrarily bisect the apex. This plane divides the apex into anterior and posterior portions. The anterior apex, which is pneumatized in 9% of patients, is a peritubal area anterior and medial to the cochlea. The carotid artery traverses the anterior petrous apex. The posterior petrous apex, which is pneumatized in 30% of patients, is a perilabyrinthine area just medial to the semicircular canals. If the patient is medically unstable and unable to tolerate general anesthesia, high-dose IV antibiotics may be attempted to eradicate the infection in place of surgery. DeWeese D. Four unusual cases of temporal bone disease. Laryngoscope. 1958 Jun. 68(6):1028-35. [Medline]. Gradenigo G. Uber circumscripte leptomeningitis mit spinalensymptomen und paralyse des n. Abducens otitischen ursprungs. Archiv f?enheilkunde. 1904. 62:255-270. Kopetzky S, Almour R. Suppuration of the petrous pyramid: symptomatology, pathology and surgical treatment. Ann Otol Rhinol Laryngol. 1931. 40:396-414. Ramadier J. Exploration de la pointe du rocher par la voie du canal carotidien. Ann d'Oto-laryngol. 1933. 4:422-444. Lempert J. Complete apicectomy (mastoidotympanoapicectomy). Arch Otolaryngol. 1937. 25:144-177. Krisht KM, Shelton C, Couldwell WT. Early Conquest of the Rock: Julius Lempert's Life and the Complete Apicectomy Technique for the Treatment of Suppurative Petrous Apicitis. J Neurol Surg B Skull Base. 2015 Mar. 76 (2):101-7. [Medline]. [Full Text]. Hendershot EL, Wood JW. The middle fossa approach in the treatment of petrositis. Arch Otolaryngol. 1973 Dec. 98(6):426-7. [Medline]. Profant HJ. Gradenigo's syndrome. Arch Otolaryngol. 1931. 13:347-378. Lindsay J. Suppuration in the petrous pyramid. Ann Otol Rhinol Laryngol. 1938. 47:3-36. Gadre AK, Chole RA. The changing face of petrous apicitis-a 40-year experience. Laryngoscope. 2018 Jan. 128 (1):195-201. [Medline]. [Full Text]. Valles JM, Fekete R. Gradenigo syndrome: unusual consequence of otitis media. Case Rep Neurol. 2014 May. 6(2):197-201. [Medline]. [Full Text]. Choi KY, Park SK. Petrositis with bilateral abducens nerve palsies complicated by acute otitis media. Clin Exp Otorhinolaryngol. 2014 Mar. 7(1):59-62. [Medline]. [Full Text]. Jensen PV, Hansen MS, Moller MN, Saunte JP. The Forgotten Syndrome? Four Cases of Gradenigo's Syndrome and a Review of the Literature. Strabismus. 2016. 24 (1):21-7. [Medline]. Lee DH, Kim MJ, Lee S, Choi H. Anatomical Factors Influencing Pneumatization of the Petrous Apex. Clin Exp Otorhinolaryngol. 2015 Dec. 8 (4):339-44. [Medline]. [Full Text]. Montgomery W. Cystic lesion of the petrous apex: transsphenoid approach. Trans Am Otol Soc. 1977. 65:32-39. Chole RA, Donald PJ. Petrous apicitis. Clinical considerations. Ann Otol Rhinol Laryngol. 1983 Nov-Dec. 92(6 Pt 1):544-51. [Medline].